This watercolor painting as the illustration for Cricket children's magazine. 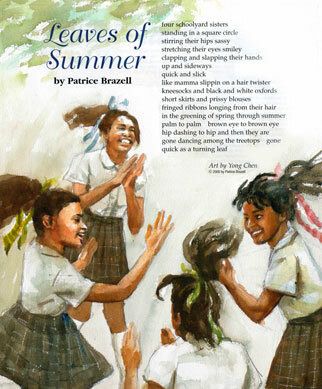 Four African American school girls dance under the summer leaves after school. Girls in the school uniforms. Tje girls laugh, talk about all the good things happen in the day, subjects they learn from the class. They dance hand in hand, round and round, their hair are dancing too. The girls dance so fast as like the wind of Summer. I use watercolor as my favorite medium for my children's books and children's magazine illustration. Just when we start thinking that hip-hop's originality and skills have been lost to commercial monotony, a new trend comes out to prove us wrong. The latest case in point: krumping (also known as clowning), a manically energetic, full-body gyrating dance style born of the creativity, anger, self-expression and frustration of youths in South Central Los Angeles. A popular birthday-party entertainer, Tommy the Clown, pioneered krumping in the wake of 1992's L.A. riots. The dance form--rooted in both the hip-hop tradition of dance battles and African tribal rituals including the use of clown makeup or warrior face paint--eventually spread to others searching for an escape from the drug abuse and gang violence of their surroundings. The result is a raw, almost seizurelike display caught beautifully on film in the documentary Rize, which hits theaters nationally June 24. Rize, directed by photographer David LaChapelle, 36, offers an intimate look at krumping, with peeks into the lives of its teenage dancers, like star players Miss Prissy and "light Eyez. The film is a departure for LaChapelle, known for his outrageous celebrity images--who could forget his iconic shot of Lil' Kim fully body-painted in Louis Vuitton insignia? Still, he effectively portrays krumping as a movement that goes beyond escaping ghetto pitfalls and outdancing opposing crews. For its performers, it is pure artistic expression and a way of life.